‘Twas the night before Christmas, when all through the house, not a creature was stirring, not even a…….turtle? With the Christmas holiday fast approaching, many families will be reading Clement Clarke Moore’s famous poem, “A Visit from St. Nicholas.” Even if you aren’t familiar with the poem, the winter solstice is a few days away, bringing with it the shortest day of the year. With dark and cold conditions aplenty, it’s certainly a good time for a nap. And no one does napping better than the sea turtles of the Giant Ocean Tank! 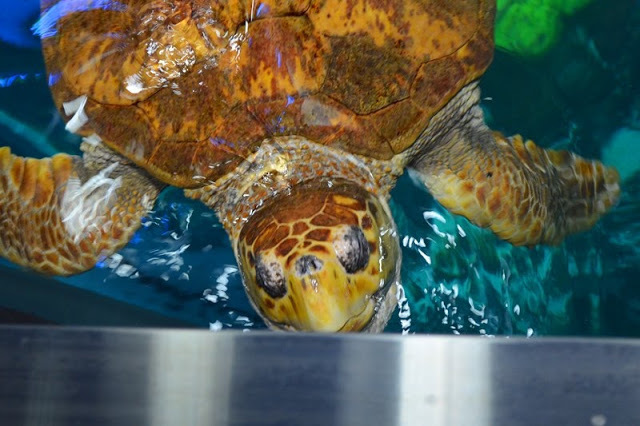 Visitors often see a seemingly lifeless turtle on the bottom of the GOT and become quite concerned about the turtle’s well-being. Believe it or not, these turtles are just snoozing! 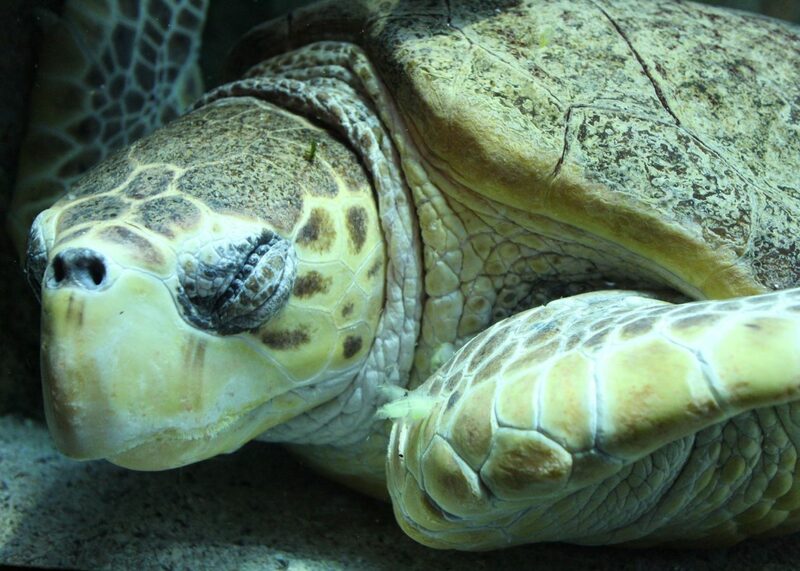 Like many of us, the turtles like to get some much needed shut-eye. 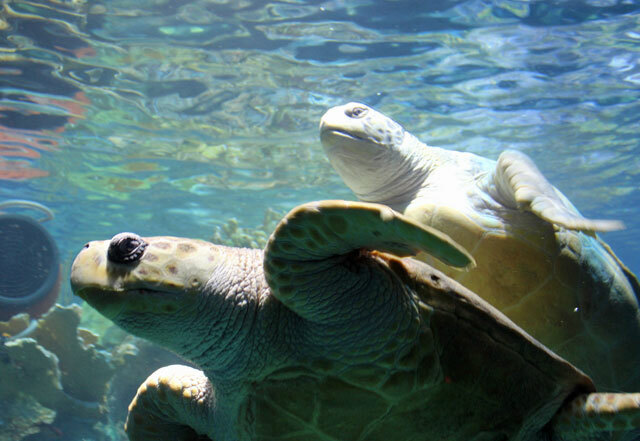 And as they can stay underwater for two hours or more, visitors may see the turtles in the same spot at both the beginning and end of their visit! A loggerhead surfaces for a breath. Sea turtles were built for life under the waves, as that’s where they spend most of their time eating, mating, migrating or sleeping. So how can they stay underwater for so long? A bunch of things! First of all, sea turtles are really quick at breathing. Just a couple of seconds are needed at the surface to replenish their lungs with new air, allowing for a quick oxygen fuel-up before a dive. Waiting to see Myrtle break the water surface of the GOT? Don’t blink, you might miss it! Once the air is in the lungs, there’s a lot more surface area than us humans for gas exchange, and more oxygen can be absorbed quickly into the body. With that newly absorbed oxygen in their lungs, blood, and tissues, turtles are really efficient at utilizing all of it. And because they are not using as many muscle groups when they are napping, metabolic rates slow down and oxygen lasts longer. 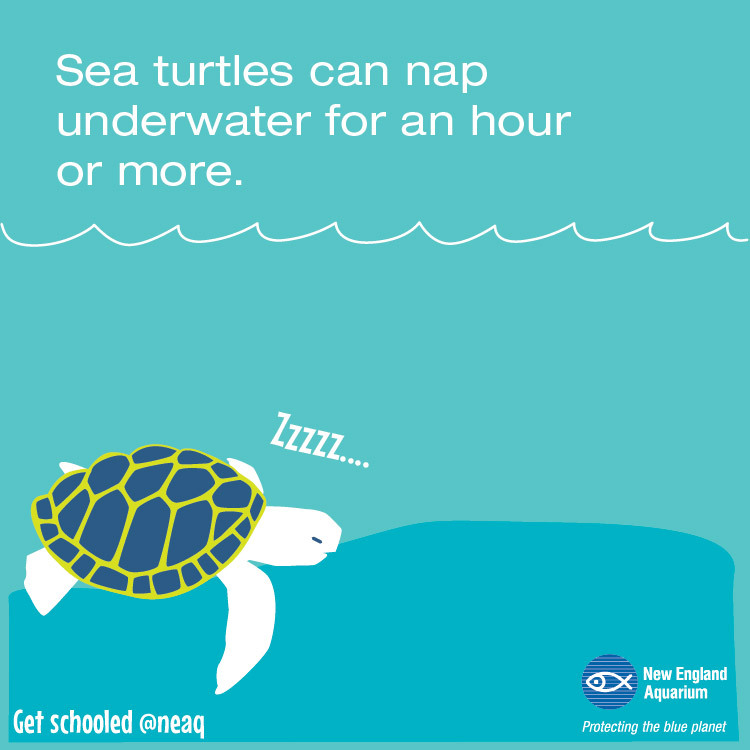 Add in other things like specialized respiratory passageways and a tolerance for low oxygen conditions and you’ve got some turtles that can take crazy long naps for several hours! Myrtle and Retread swim in the Giant Ocean Tank.